A steep acetabular inclination angle is the primary cause of adverse wear related failure with well-designed metal-on-metal bearing hip resurfacing arthroplasties (HRA). One recent study demonstrated that positioning acetabular components of stemmed total hip arthroplasties (THA) within the “Lewinnek safe zone” is difficult; only 62% had AIA within the safe zone. However, we have previously demonstrated that acetabular components for HRA can be placed with an AIA<55° in 96% of cases using intraoperative X-ray. We now report our results using a refined technique, suggested by our previous study, as well as a lower acceptable limit for inclination angle (AIA<50°). We wanted to determine how often the method allowed us to achieve an AIA in the “safe zone for HRA”. We also wanted to know if repositioning an acetabular component intraoperatively to achieve an ideal position made it more likely to shift postoperatively. Only one of 513 cases had an AIA outside our “safe range for HRA” on the standing X-ray taken on the first postoperative day. In this case, the intraoperative radiograph showed an AIA of 40°, while it was 50° on the standing postoperative radiograph. The acetabular component was judged not to have shifted. In all of the remaining 512 (99.8%) cases the AIA was within the safe range of AIA< 50°. 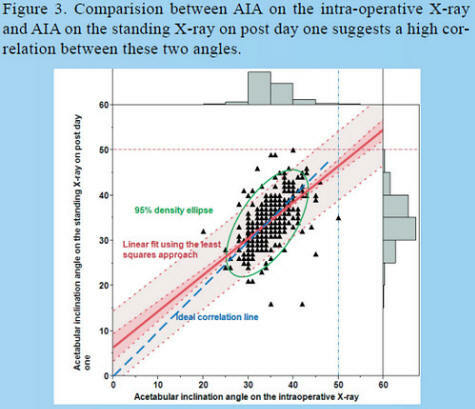 The average absolute difference between the AIA on the portable intra-operative X-rays and the AIA on the standing X-ray on post day one was 2.6°±2.9° (range: 0° to 26°). The variance was ≥ 5° in 83 (16.2%) cases and was ≥ 10° in 20 (3.9%) cases. 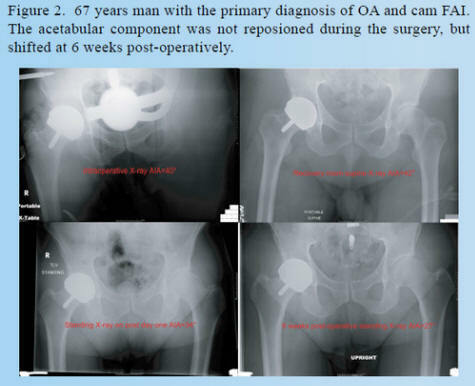 One (0.7%) component in the group in which the acetabular component was repositioned during surgery was found to have shifted by the 6 week visit, while five (1.4%) components in the remaining 369 cases (without intraoperative repositioning) were found to have shifted (P=0.5). In summary: 1. In 99.8% (512/513) cases, an AIA<50° was achieved on post day one standing X-ray using an intraoperative target of AIA<45°. 2. 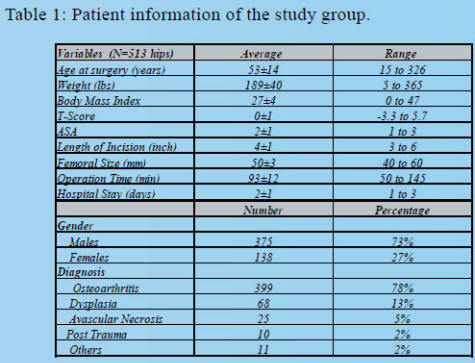 The difference of the measured AIA between the intraoperative and the postoperative standing pelvis XR was 2.6°±2.9°. 3. 28% cups required intraoperative repositioning to achieve the intraoperative target. 4. 1 % (6/513) acetabular components shifted postoperatively without adverse consequences. 5. Repositioning acetabular components did not increase the chance of a postoperative cup shift. Message: We suggest measuring an intraoperative AIA and repositioning the acetabular component until the AIA< 45°.